TukTuk Designs features items that have been meticulously crafted from 100% cotton with plenty of details around the cuff, collar, and placket. Each shirt is bold, fun, comfortable, and stylish. They can be seamlessly worn from a playdate to a party. We are very excited to be collaborating with such a boy-centric brand. We love to find amazing and stylish looks for our boys, that is why The Boy’s Store exists. So it is fabulous when we find like-minded companies ready to collaborate with us and help bring you and your boys’ more amazing styles to choose from. 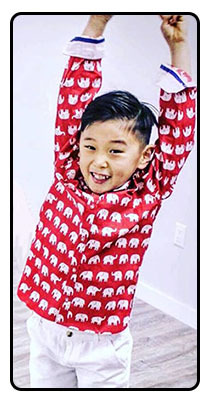 TukTuk Designs will be featured at The Boy’s Store beginning this month. Our collaboration is special because each item will be drop-shipped directly to you. Be sure to check out the great designs soon. We are already in the process of adding them to the store. You do not want to miss out! This entry was posted in Brand News and tagged boys clothes, boys shirts, boys style, boys tees, dropship, new boys clothes, new brand, the boys store, tuktuk designs on May 25, 2018 by Lacy. In February we made our annual trip to Las Vegas to check out the incredible brands at Magic! We met new Brands, Designers, and saw lots of great new styles. If you are a follower on our Instagram account you might have seen some of our photos. If you aren’t a follower, you should be! We love to post little tidbits of our daily activity, including sharing pictures of our new items. While at Magic we shared some fun snapshots of the world of Magic! We saw some amazing new looks from some of our favorite brands at Magic. We saw great new looks from Appaman, Mulberribush, and Wes and Willy. And we are very excited to bring some of the new looks later this season. We also got to meet a new brand Rowen Christian Couture! This fun brand was created to show the world that our boys matter too, and they deserve fun clothes as much as our girls do. Created after twin brothers Rowen and Christian, the brand features fun and tough looks for spectacular boys. We got to meet them and they are definitely two of the cutest brand reps we have seen! This season we are also excited to bring Troy James Boys Accessory Collection to The Boy’s Store! This fun brand features incredible accessories for boys 0-6 years, and we are very excited to bring you some of their fun items this year. So look forward to some great scarves, bow ties, belts, and suspenders soon! We had a great time at Magic and cannot wait to bring you some great new items at The Boy’s Store! This entry was posted in Brand News and tagged Accessories, Appaman, magic, Mulberribush, new brand, new brands, new looks, rowen Christian, rowen Christian couture, the boys store, Troy James boys collection, Wes and Willy on March 1, 2015 by Lacy. This month we highlighted our newest brand, Good Boy Friday. We learned all about the great brand created and designed by Kellee Bachour. This week we want to show you some of the items that we currently carry from the Good Boy Friday line. Don’t forget to check back periodically for new items, and watch for the highly anticipated fall line later this year! 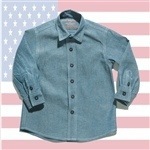 Chambray Button-Down Shirt by Good Boy Friday: this long sleeve chambray button-down shirt is comfortable for an active boy. The nice blue color is a favorite amongst boys and the easy button-down style makes it easy to wear and easy to move in. It is machine wash cold which makes it a favorite among moms looking for easy care, and to top it all off it is made in the USA. Lou Pant by Good Boy Friday: these great pants are incredibly versatile. They come in a variety of colors including carrot, olive, berry, and French grey. They have a 100% cotton lining but are 55% polyester and 45% viscose exterior. This makes them comfortable yet strong and durable. They are machine wash cold for easy care and cleaning and are made 100% in the USA. Good Boy Friday prides itself on creating quality products that are stylish but are completely comfortable for growing and active boys. We are very excited to carry this new brand and we look forward to bringing you great new styles soon. So don’t forget to check back to see any new items! This entry was posted in Brand News, Featured item and tagged Brand feature, good boy Friday, new brand, Pants, shirts, the boys store on February 22, 2013 by Lacy.